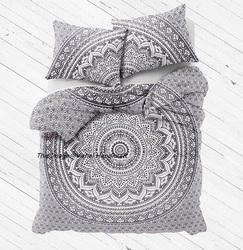 Manufacturer of a wide range of products which include ombre cotton donna duvet cover, tapestry cotton duvet cover, mandala cotton donna duver covers, vintage handmade jaipuri quilt and silk patchwork kantha quilt. 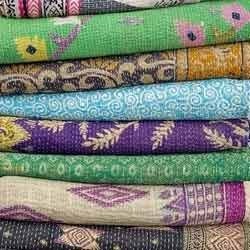 We are supplying Vintage Handmade Jaipuri Quilt with the help of our expert professionals and superb designers. These are printed by lots of colors. They are very intricate and made of the pure fabric. They are weaved with a tight stitching. They are looking very attractive in your house. We are offering them in various kind of designs and shapes. They are very fashionable, elegant and comfortable. 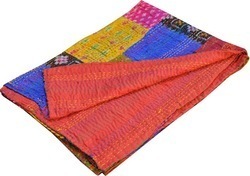 This is a hand-made Silk Patchwork Kantha with Katha work quilt/bedspread. It is made from vintage old silk saris and softly quilted by woman of rural area. 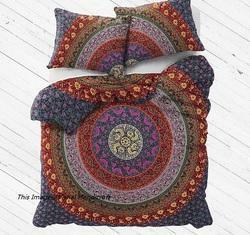 This very pretty quilt is a patchwork pattern and Gudri (Kantha) work looks great on the bed or walls. This cotton Bedspread set features a with multicolor patches. 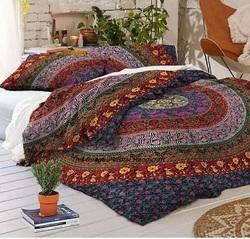 This Handcrafted, Hand Embroidered Patchwork Traditional Bedding Bedspread/Huge tapestry is made with silk from Rajasthan. This quilt is backed by pure cotton and looks great on you decor. It is reversible, can be used from both sides. Finely stitched and beautifully detailed with quilting to add texture and for durability. We are looking for export inquiries from Japan, Australia etc.